Melanie is a really interesting case. 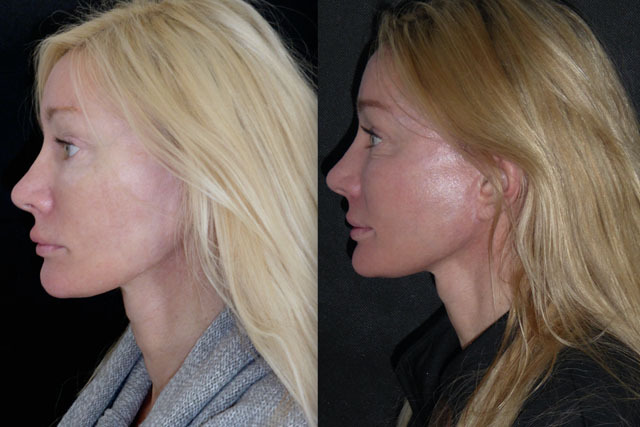 She is an American lady who has had several previous facial plastic surgeries. 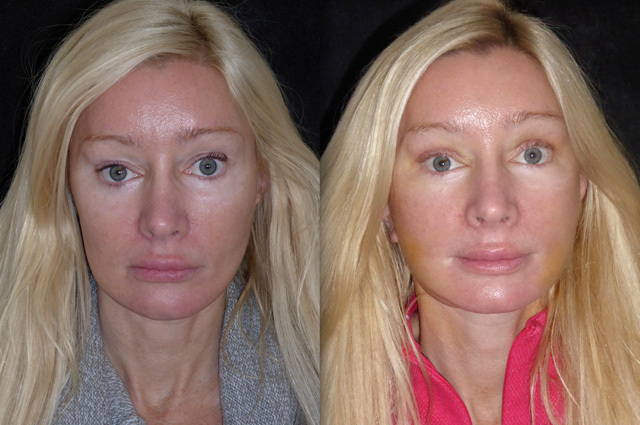 2 previous facelifts, upper and lower eyelid surgery, cheek implants, fat transfer and fillers had transformed her face beyond her recognition. She had sought help in the US for repair of these but had been told that the only possibility was more fat transfer. She then came to see me in London. Her scars from her previous procedures were visible. 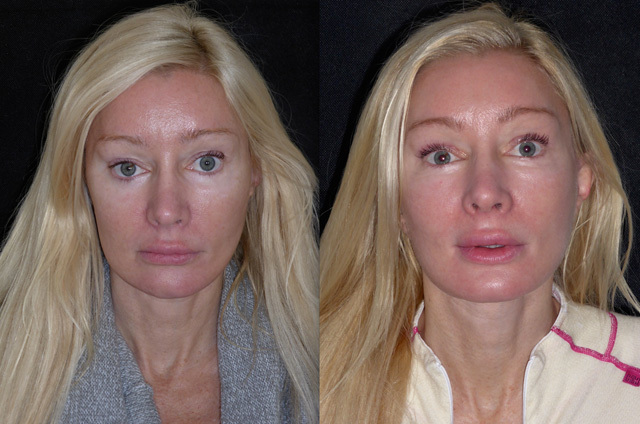 There was too much backward tension in her facial pull, asymmetric fat transfer yielded a bulge in her right jowl and her eyes had become rounded and unnatural. 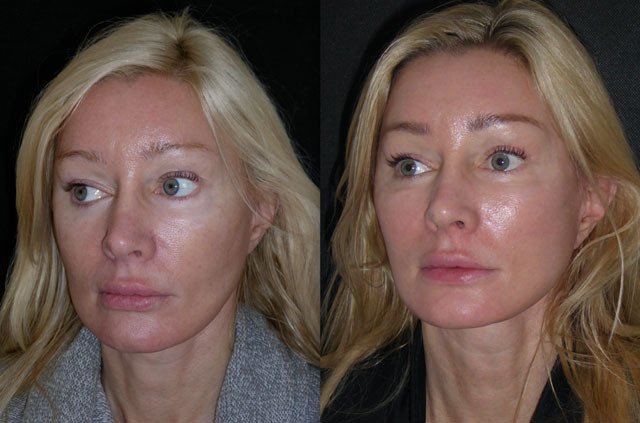 I explained that further surgery was risky, the facelift would be exploratory and reconstructive but I was confident I could help her regain her natural beautiful looks. Here is her story. 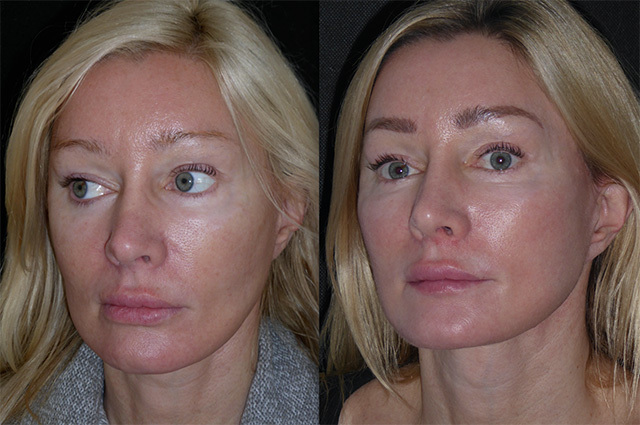 Morning after revision upper blepharoplasty, face and neck lift, scar repositioning and facial liposculpture. Without doubt one of the most complex faces I have operated on. Dense scar tissue, residual sutures and transplanted fat all needed to be meticulously dissected out whilst preserving the remaining normal soft tissue to use it in reconstruction. 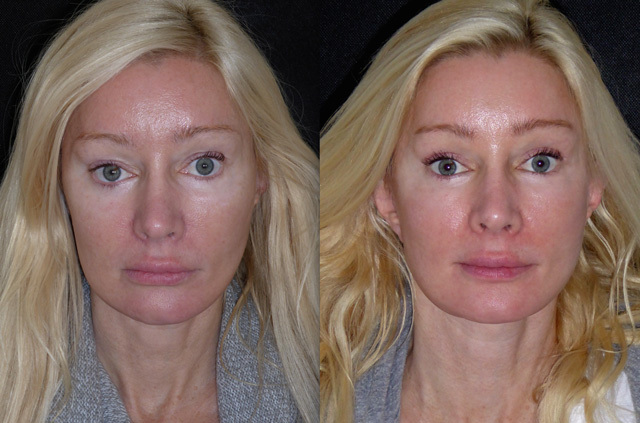 After reversing the previous surgeries I have re-vectored her facial tissues to create more harmonious balance in her face. The upper lids have been revised and a concurrent mid facelift has improved the lower eyelid rounding. I removed very little skin as so much had been removed previously, infact I really only removed her previous incision lines. 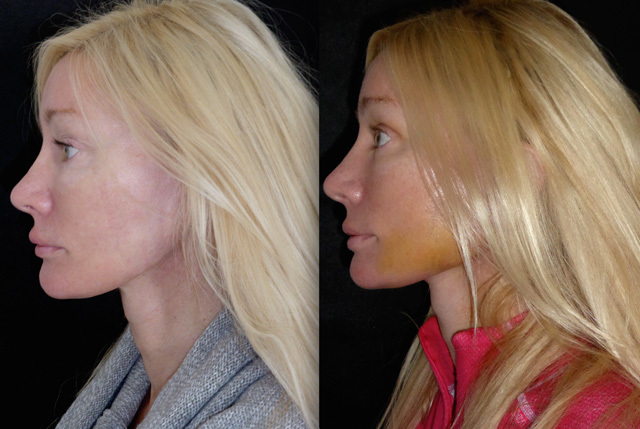 Only 18 hours after surgery we can already see the early improvement in her facial volume and contour. 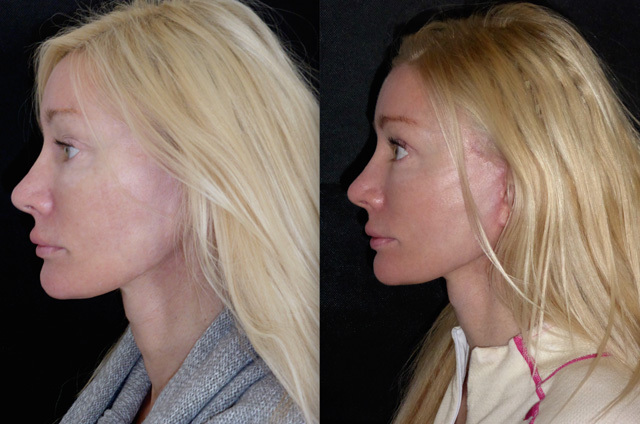 This is how facial plastic surgery should be, conservative, atraumatic and natural. Really looking forward to see how she progresses. Melanie is back for removal of her eyelid stitches and looks wonderful. 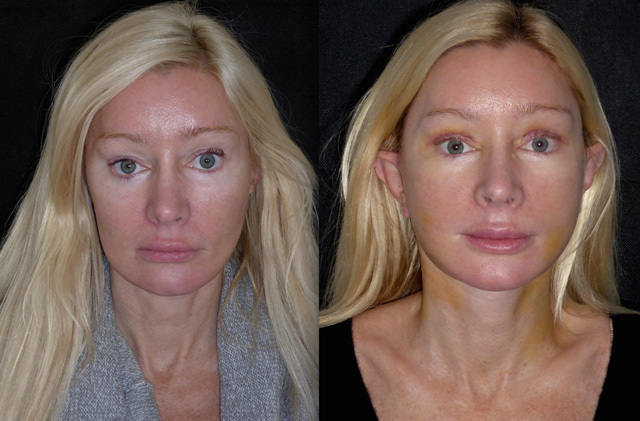 I am amazed at the lack of bruising considering the extent of surgery performed. 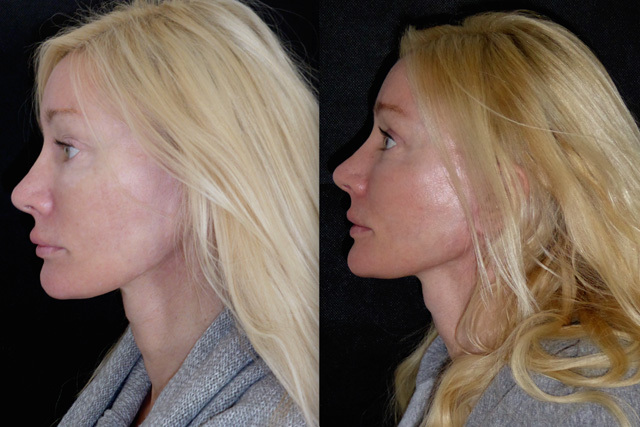 Her face has better balance, the mid facelift and upper blepharoplasty have given her back her natural beautiful eye shape, and the lower face, neck lift and liposculpture have redefined her jawline and a pleasing facial curve. 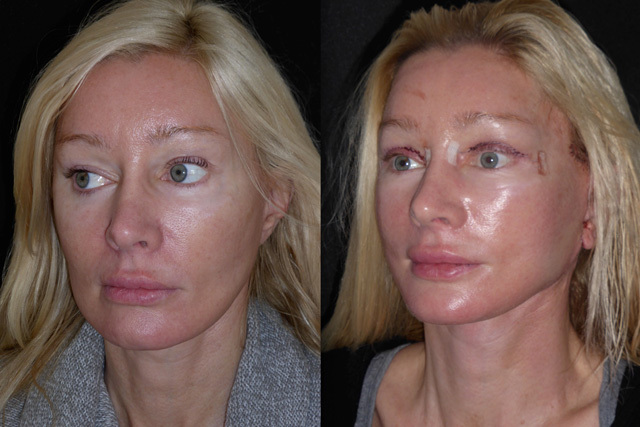 Just 2 days on, a week after Melanie’s reconstructive facelift, she continues to look better and better. 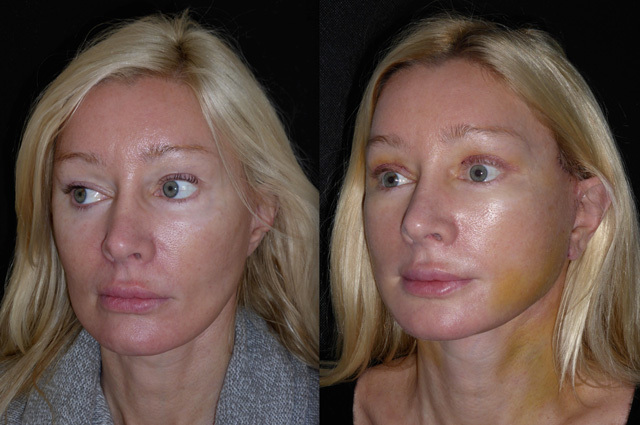 Bruising has now turned yellow and descended and will be gone in a couple of days. She looks fresh, invigorated and rejuvenated. Just gorgeous. Time now to work on her skin and address the previous fat transfer to her lips. 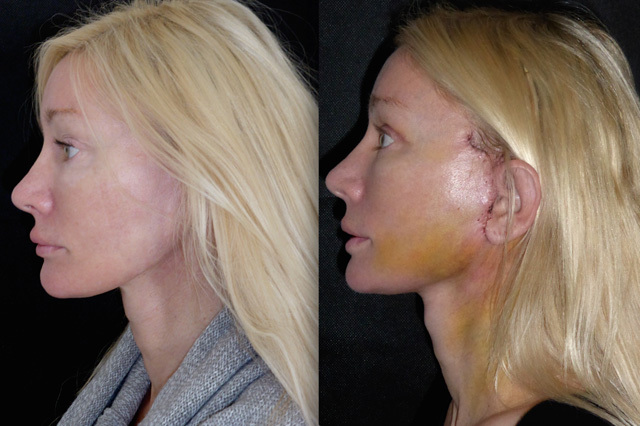 Just five weeks after surgery Melanie looks fantastic. 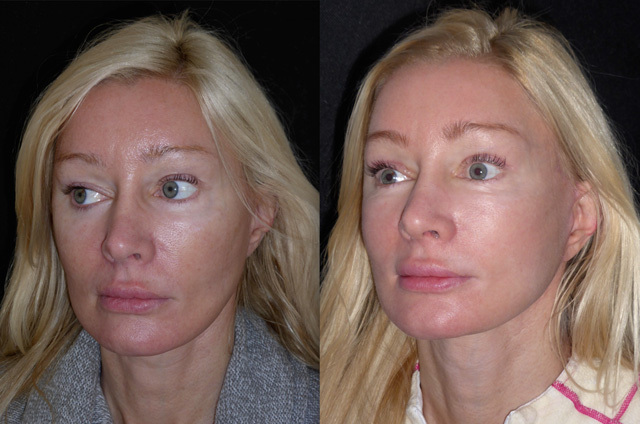 The mid facelift has reinforced her lower eyelid support and in conjunction with a revision reconstructive upper blepharoplasty her eyes look much more natural. 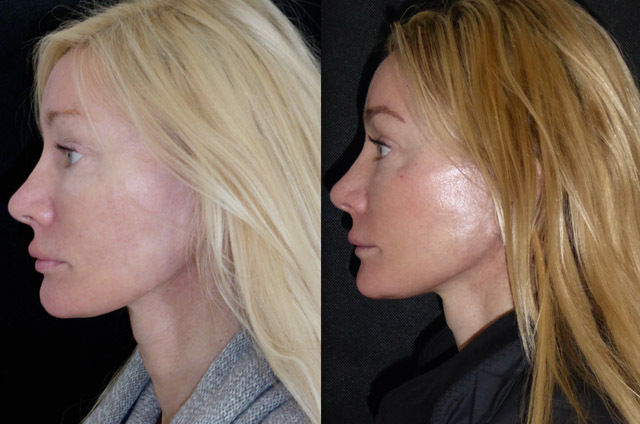 Elevation of her SMAS has filled her mid face giving more youthful volume and improved her contour. 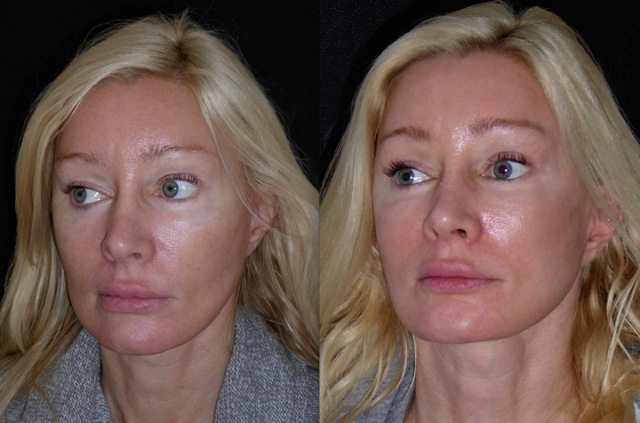 Her skin is now glowing on prescription skin care - hyper pigmentation, rosacea, and pore size have all decreased beautifully. I plan to start repair of her previous lip work shortly. 12 weeks after surgery Michelle is back for review. Her scars are progressing really well and her face looks more proportionate. 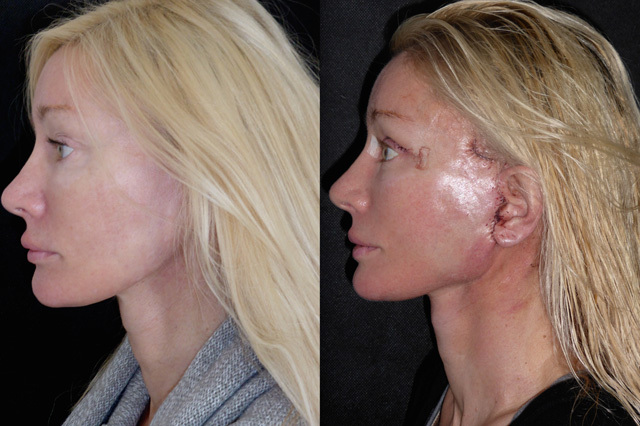 Her revision surgery was not about rejuvenation but more beautification of her face. 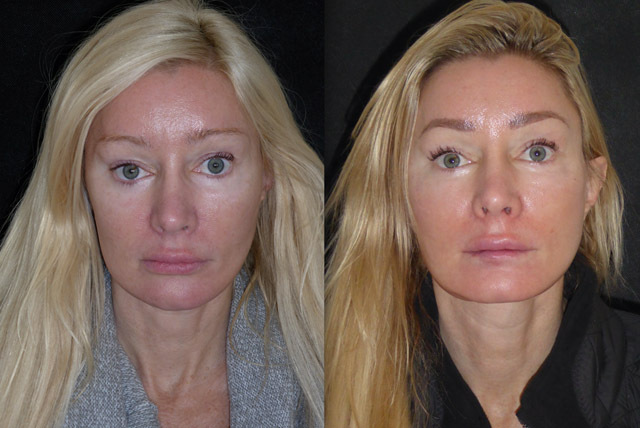 Previous surgery had left her asymmetric and unbalanced. 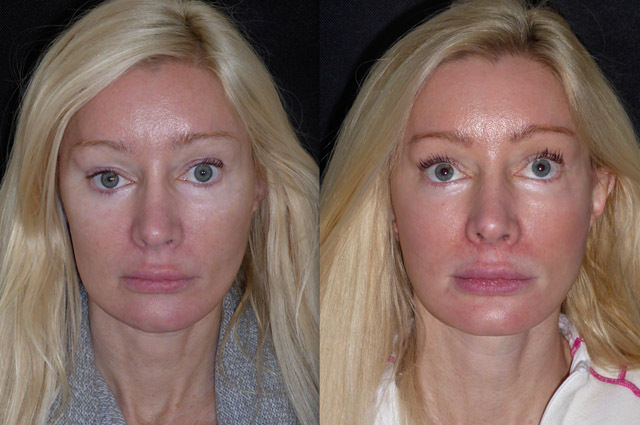 Her lips in these photos are paler as they have just been anaesthetised prior to steroid injections to induce atrophy of her previously transplanted lip fat. 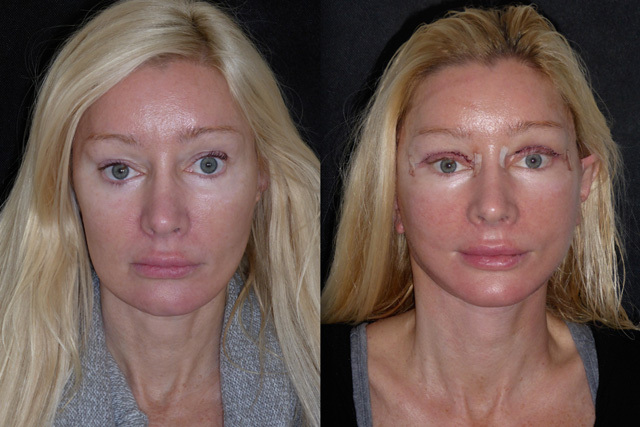 Melanie is now 5 months from her revision reconstructive facelift. She looks a different lady now that her previous work has been revised and she has had time to settle and heal. 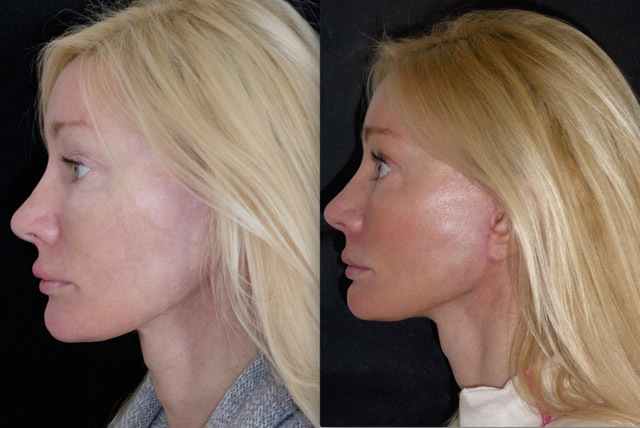 For a lady the other side of 50, she could easily pass for twenty years younger than her natural age - she looks just gorgeous - this surgery wasn’t for rejuvenation but facial harmony and balance. 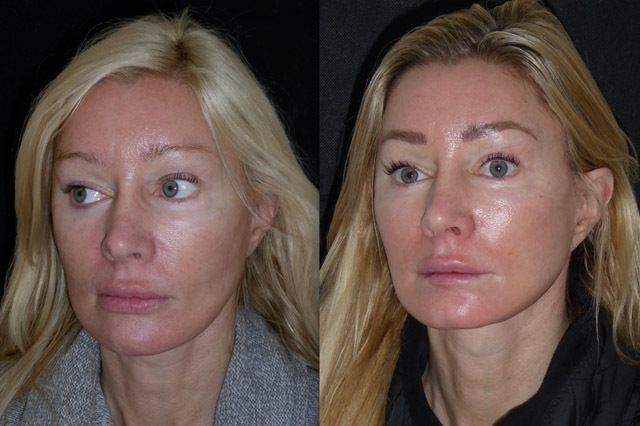 Cortisone injections to her previously transplanted lip fat has helped them shrink to give a much more natural shape and her mid facelift has restored those rounded eyes to a more pleasing shape. Over half of my cases now are revision of others work, it is more challenging as tissue planes, anatomy and previous scarring preclude ‘basic’ lifting techniques and dissection is more extensive, but I love it and thrive on it. At a year after surgery Melanie looks wonderful. 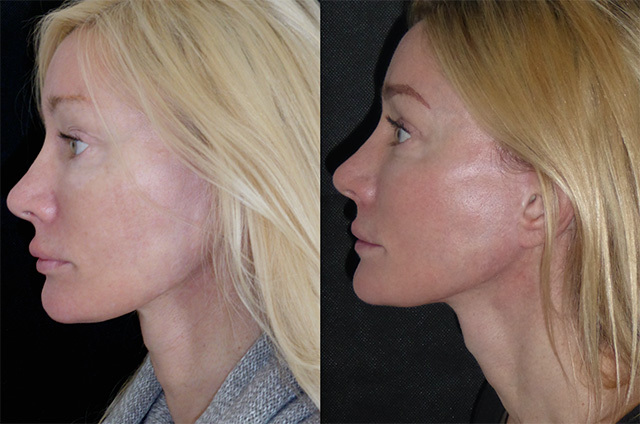 Fully healed, her face has better proportions and balance now the backward vector facelift has been reversed and the fat transfer removed. Melanie was already a beautiful lady but her face had been altered beyond her recognition. She now looks like she feels - great! 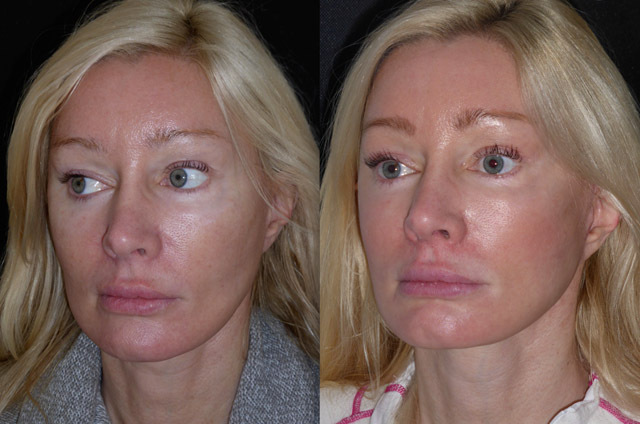 The steroid injections into her lower lip fat transplants have reduced the size of her lateral lip fullness but it still remains next step is a lip surgical lip reduction to remove the transplanted fat. 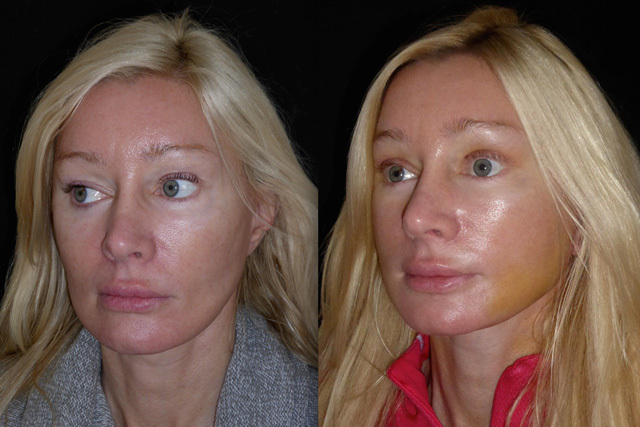 6 weeks after lip reduction surgery, Melanie’s facial restoration is now complete. 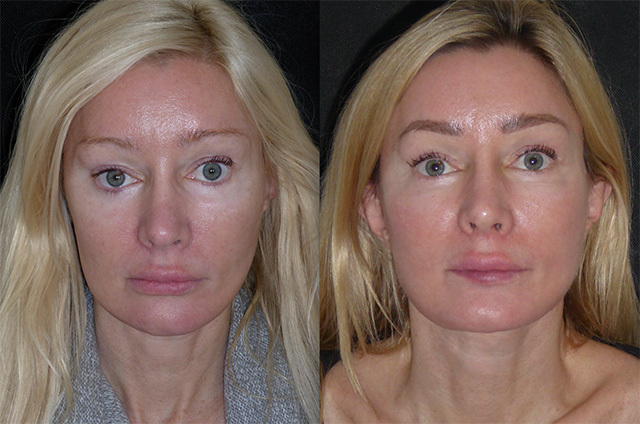 I have reduced the transplanted lip volume in her lateral lower lip which gives better balance to her lower facial third. Globally her face is more proportionate. She looks and feels great! 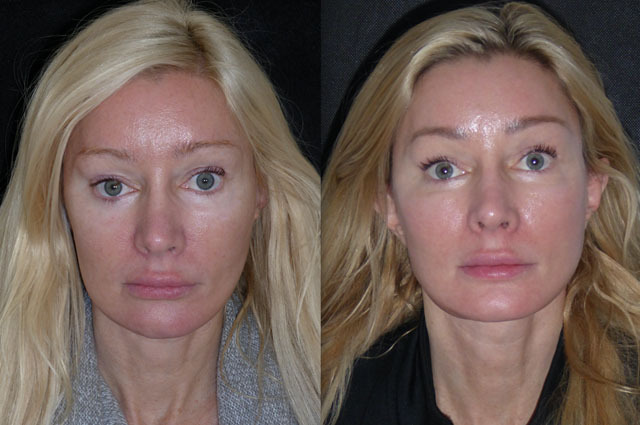 Here is Melanie nearly 18 months out from her revision facial surgery and 3 months after lower lip reduction. Beautiful lady, beautiful result. So pleased for her, she has had quite a journey but her face is now proportionate and balanced once more.